viaLibri ~ AUTOGRAPH LETTER SIGNED BY FRENCH VIOLINIST AND COMPOSER HENRI MARTEAU RECOMMENDING CHILD PRODIGY VIOLINIST FLORIZEL VON REUTER. 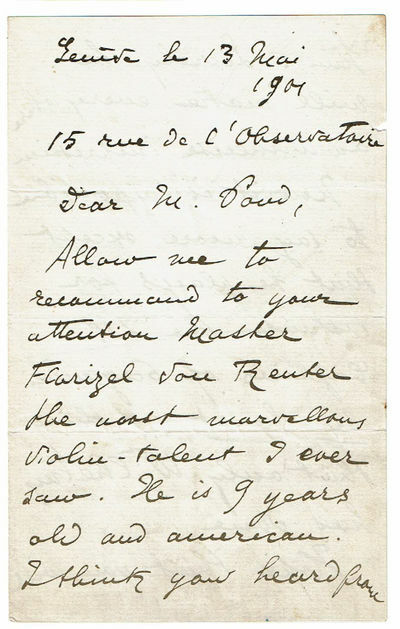 AUTOGRAPH LETTER SIGNED BY FRENCH VIOLINIST AND COMPOSER HENRI MARTEAU RECOMMENDING CHILD PRODIGY VIOLINIST FLORIZEL VON REUTER. Geneva [Switzerland]: May 13, 1901., 1901.. Very good. - Letter penned in black ink & filling 2-1/2 sides of a sheet of cream note paper folded once to form 4 sides, each 7 inches high by 4-3/8 inches wide. Signed "Henri Marteau". There is a tiny crease & piece out of the front edge of each side. Folded 3 times for mailing. Very good. Marteau writes to Major J. B. Pond of the Pond Lecture Bureau, New York City, drawing his attention to boy violinist Florizel von Reuter. He calls him "The most marvelous violin-talent I ever saw. He is 9 years old and American. I think you heard from him. Surely he will make everywhere an immense impression....He played for instance the 24 Caprices of Paganini by heart a thing that only Wilhelm [Heinrich Wilhelm Ernst?] has done. "Henri Marteau [1874-1934] was a French violinist and composer. He made his debut when he was only ten years old at a concert given by the Vienna Philharmonic Society conducted by Hans Richter. His professional debut took place in London in 1888 at another Richter concert. A series of tours took him to America and Russia in the 1890s. He taught violin at Geneva Conservatoire and on the death of Joseph Joachim he was called to the Hochschule of Berlin where he became head of the violin department. During World War I he was expelled from Germany and moved to Sweden where he became a citizen.Florizel von Reuter [1890-1985] was an American-born violinist and composer, a child prodigy who went on to an adult career, mainly in Germany, as a distinguished soloist and teacher of violin. Von Reuter had his first violin lessons from his mother and went to London to study in 1899. In 1901 he graduated from the Geneva Conservatory, where there was some debate about graduating a student at such a young age. His first professional concert was in Switzerland in 1900. After giving thirty concerts there, he began to tour America where he was introduced as a protege of Joseph Joachim. He later became interested in the occult and authored "Psychical Experiences of a Musician" (1928) for which Arthur Conan Doyle wrote a foreword.